History is more than a series of events, and in his final book, the late Tony Judt discussed pivotal ideas of the twentieth century. In a series of conversations with his friend and fellow-historian Timothy Snyder, author of Bloodlands, Judt covers topics including the role of the intellectual in public life, the task of the historian, and the case for social democracy. Tony Judt is currently considered a "single author." If one or more works are by a distinct, homonymous authors, go ahead and split the author. 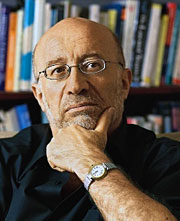 Tony Judt is composed of 7 names. You can examine and separate out names.